F17T8/850 lamps are supplied with the fixture as a standard feature. Fixture is supplied with stainless steel mounting brackets as standard equipment. Fixture housing is constructed of non-metallic glass reinforced polyester. Silicon gasket is poured in-place. Diffuser is high impact acrylic. 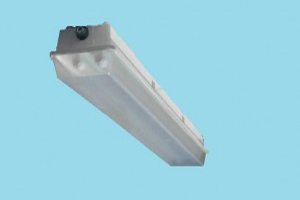 Fixture can be surface mounted or suspended. Fixture is warranted for one year from delivery date against manufacturing defects. Ballast warranty is provided through the ballast manufacturer.